Kit Rae Mithrokil Swords for sale are 25 1/8th inches in all. 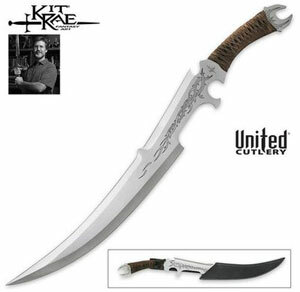 These swords are full tang and feature tempered one piece 3CR13 stainless steel construction. The 15 ½ inch blade features the Kit Rae emblem and silk screened vine designs. They have a real leather grip and a genuine and faux leather scabbard. The famous Mithrokil was the short sword used by the ancient Mithrodin warrior Kethol Av Torketal. Buy the official Kit Rae Mithrokil Swords for $69.99. Kit Rae Mithrokil Swords for sale are 25 1/8th inches in all. These swords feature a black finish and are full tang, tempered single piece 3CR13 stainless steel construction. 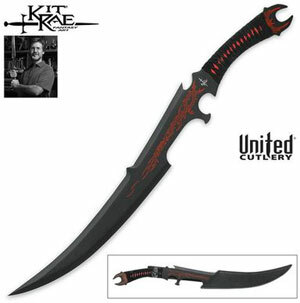 The 15 ½ inch blade features the Kit Rae emblem and red colored silk screened vine designs. They have a real leather grip and a genuine and faux leather scabbard. The famous Mithrokil was the short sword used by the ancient Mithrodin warrior Kethol Av Torketal. Buy the official Kit Rae Mithrokil Swords for $69.99.